Originally published in the WHO Goodwill Ambassador’s Newsletter for the Elimination of Leprosy, Issue No. 35 (December 2008). The information was correct and current at the time of publication. G. Venu Gopal is part of the National Forum’s push for social integration. G. Venu Gopal, 56, sits at his desk in the North India office of the National Forum of people affected by leprosy and reflects on the progress the organization has made in its first three years. As branch general secretary, Venu Gopal oversees a 17-strong committee that represents the interests of some 250 self-settled leprosy colonies in 10 of India’s northern states. For Venu Gopal, it is also a great personal achievement. “I had been working in a small circle before the establishment of this National Forum office. Now I have the chance to serve many people in a broad way,” he says. Originally from Andhra Pradesh, Venu Gopal was diagnosed with leprosy during his second year in college, leaving him unable to complete his degree. After seeing the social stigma that attached itself to his family when he was hospitalized for treatment, he decided to leave home. 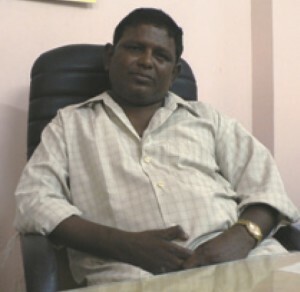 His new acquaintance helped him to join a colony and Venu Gopal became involved in a number of different organizations. “I learned more, and asked people to show me when I didn’t understand things,” he says. Over time, he gained the skills and experience that he now puts to good use as National Forum branch general secretary and as a community worker for Help Age and Help Age International, for whom he monitors the welfare of 300 elderly leprosy-affected people. “It took me 10 years to learn to handle all these things. Now I am capable. I can speak six languages,” he says proudly. In their drive to empower people affected by leprosy, Venu Gopal and his National Forum colleagues are visiting every colony in every state, encouraging them to stand on their own feet and urging them to turn their back on begging. In the process, he is telling them to make income-generating projects a priority, and instructing them in how to draw up proposals for funding that can be submitted to the Sasakawa-India Leprosy Foundation (SILF), with which the Forum expects to work closely.